“Mercy Mercy Me (The Ecology)” was the second single from Marvin Gaye’s 1971 album, What’s Going On. Following the breakthrough of the title track’s success, the song, written solely by Gaye, became regarded as one of popular music’s most poignant anthems of sorrow regarding the environment. Led by Gaye playing piano, strings conducted by Paul Riser and David Van De Pitte, multi-tracking vocals from Gaye and The Andantes, multiple background instruments provided by The Funk Brothers and a leading sax solo by Wild Bill Moore, the song rose to number 4 on Billboard‘s Pop Singles chart and number one for two weeks on the R&B Singles charts on August 14 through to August 27, 1971. The distinctive percussive sound heard on the track was a wood block struck by a rubber mallet, drenched in studio reverb. The song also brought Gaye one of his rare appearances on the Adult Contemporary chart, where it peaked at number 34. In Canada, “Mercy Mercy Me” spent two weeks at number 9. In 1991, a music video of the song was released by Motown Records, featuring appearances by celebrities such as Smokey Robinson, Johnny Gill, Big Daddy Kane, Holly Robinson Peete, Ralph Tresvant, Bobby Brown, Rosie Perez, Bell Biv Devoe, Wesley Snipes, Tyler Collins (singer), Malcolm Jamal Warner, Diana Ross, Stevie Wonder, David Bowie, Stephanie Mills, Debbie Harry and Vanessa L. Williams. As the single became his second million-seller from What’s Going On, the album started on the soul album charts in the top five and began charging up the pop rankings. 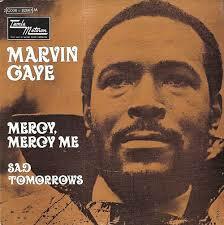 “Mercy Mercy Me (The Ecology)” soon became one of Gaye’s most famous songs in his extensive catalogue. In 2002 it was his third single recording to win a “Grammy Hall of Fame” Award. As on “Inner City Blues”, Bob Babbitt, not James Jamerson, plays the bass line. Bob Babbitt (born Robert Kreinar; November 26, 1937 – July 16, 2012) was a Hungarian-American bassist, most famous for his work as a member of Motown Records’ studio band, the Funk Brothers, from 1966 to 1972, as well as his tenure as part of MFSB for Philadelphia International Records afterwards. Also in 1968, with Mike Campbell, Ray Monette and Andrew Smith he formed the band Scorpion, which lasted until 1970. He is ranked number 59 on Bass Player magazine’s list of “The 100 Greatest Bass Players of All Time”. Babbitt traded off sessions with original Motown bassist James Jamerson. When Motown moved to Los Angeles, Babbit went in the opposite direction and ended up in New York; while making occasional trips to Philadelphia. In this new city he worked on recordings for Frank Sinatra, Barry Manilow, Gloria Gaynor, Robert Palmer, and Alice Cooper. During this time his most notable successes were “Midnight Train to Georgia” by Gladys Knight & the Pips and “The Rubberband Man” by The Spinners. The Pittsburgh-born Babbitt’s most notable bass performances include “Signed, Sealed, Delivered I’m Yours” by Stevie Wonder, “War” by Edwin Starr, “The Tears of a Clown” by Smokey Robinson & the Miracles, “Mercy Mercy Me (The Ecology)” and “Inner City Blues” by Marvin Gaye, “Band Of Gold” by Freda Payne, “Ball of Confusion (That’s What the World Is Today)”, and “Just My Imagination (Running Away With Me)” byThe Temptations. He participated in hundreds of other hits, including “Little Town Flirt” by Del Shannon, “I Got a Name” by Jim Croce, and “Scorpio” by Dennis Coffey & the Detroit Guitar Band. He played on the Jimi Hendrix albumCrash Landing. He also played bass on Cindy Bullens’ 1978 album, Desire Wire. He accepted an offer from Phil Collins to perform on his album of Motown and 1960s soul classics, Going Back, and also appeared in Collins’ Going Back – Live At Roseland Ballroom, NYC concert DVD. He appeared on stage in an episode of American Idol, backing up Jacob Lusk’s performance of “You’re All I Need To Get By” for AI’s Motown Week in March 2011. In 2003, Babbitt played on Marion James’ album, Essence, on Soulfood Records, and amongst others playing on the record were Beegie Adair, Reese Wynans, Jack Pearson (The Allman Brothers), and drummer Chucki Burke.